The Intermountain West does not have the diversity of deciduous tree species present in New England that affords that region such spectacular fall scenery. Much of our autumn color comes in yellow/orange tones from aspen trees. One local region benefits from an additional color splash - along the Palisades Reservoir in eastern Idaho. 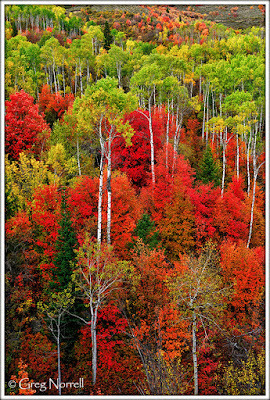 In that area, there are mountain maples occasionally interspersed with the aspens that provide vibrant red tones. The maples generally peak a bit before the aspens, which can provide for a beautiful color combination, with aspens along a continuum from green to yellow, mixed with peak red maples. Now is the time to witness this treat of nature. To enjoy it in person, drive on US Hwy 26 past the dam for the Palisades Reservoir and watch closely in the ravines on the uphill side of the road. There are several locations rich with the red maple color. There are maples present occasionally along the Snake River Canyon well into Wyoming, so it's a nice autumn drive to leisurely savor. Technical Info: The above shot was taken with a Nikon D800E with a 24-70mm f/2.8 lens at f/8, exposure of 1/200s at ISO 250. Focal length was 45mm. Basically adjust exposure time such that any wind moving the leaves is minimal within the exposure. Note that usually in landscape photography, we are trying to create the illusion of depth as we transform a three dimensional view into a two dimensional image. In this case, I capitalized on the loss of the depth dimension to produce a 'wall' of color. The hillside definitely slopes upwards in person, but that slope is largely unapparent in the resulting image. Shooting nature is always hard. You need to make all possible things to get great light to see the perfect structure, but I make great photos after editing them with a help of this macphun.com.